North Atlantic Books, 9781623173616, 256pp. 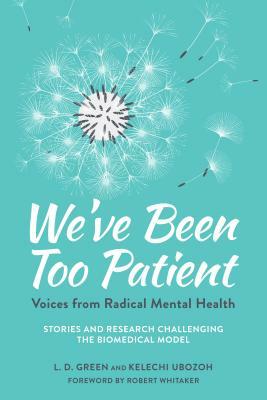 The twenty-five unflinching essays and poems in We've Been Too Patient are written by and for people with lived experience of the mental health system in America. This book is also for loved ones and allies; therapists; educators and academics in psychology, psychiatry, sociology, and mad studies as well as their students; workers in mental health nonprofits and social service agencies; and mental health advocates and activists. Overmedication, police brutality, electroconvulsive therapy, involuntary hospitalization, traumas that lead to intense altered states and suicidal thoughts: these are the struggles of those who are labeled "mentally ill." Much has been written about the problems of the mental health care system, but this book gives voice to those who have endured psychiatric "care" themselves. The stories in the book give hope and speak to radical healing in the form of peer support, spirituality, art, and the power of story itself, offering alternatives to the "magic bullets" of drugs and dehumanizing diagnoses. From the mad pride movement to the consumer movement to trauma-informed care, We've Been Too Patient is dedicated to finding working alternatives to the "Mental Health Industrial Complex," often in unexpected ways and places: through friendship, respect, and centering on the truth of lived experience. L. D. GREEN is a queer writer, performer, educator, and mental health advocate whose work has been published in The Body is Not an Apology webzine, Sinister Wisdom, Foglifter, sPARKLE + bLINK, and truth-out.org. She is a poetry slam champion and has performed at the National Queer Arts Festival and the San Francisco Fringe Festival. A graduate of Vassar College, she earned her MFA in Creative Writing from Mills College and is a Lambda Literary Fellow in Fiction. She participated in the Tin House Writers Workshop and was a Catwalk Artist in Residence. She was involved in the Bay Area chapter of The Icarus Project (a support network and education project by and for people who experience the world in ways that are often diagnosed as mental illness) from 2009-2011 and has given presentations for Youth in Mind at the California Mental Health Advocates for Children and Youth. As an assistant professor of English at Los Medanos College in Pittsburg, California, she teaches composition, creative writing, and literature. She writes and enjoys poetry, creative non-fiction, and speculative fiction. KELECHI UBOZOH is a Nigerian-American writer, mental health advocate, and public speaker. She was the first undergraduate ever published in the New York Times. Ubozoh was featured in the SAMSHA Voice Award-Winning documentary The S Word, which follows the lives of suicide attempt survivors in an effort to end the stigma and silence around suicide. Her story is featured in the January 2019 edition of O, The Oprah Magazine and on the Good Morning America website. Ubozoh has appeared on The Mental Illness Happy Hour podcast hosted by comedian Paul Gilmartin, presented at Cornell University, and been featured on CBS This Morning with Gayle King. A popular presenter and keynote speaker, Ubozoh has supervised mental health stigma discrimination reduction programs and led communication operations at a mental health nonprofit organization, PEERS. Her poetry was recently published in an anthology of San Francisco Bay Area writers of color, Endangered Species, Enduring Values. She currently works as a peer and community engagement manager at CalMHSA.